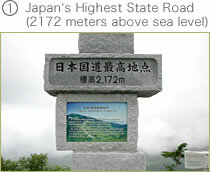 This state road runs near the boarder of Gunma and Nagano Prefectures, and is the highest state road in the country. 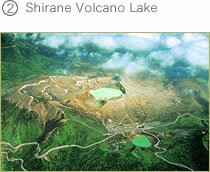 This volcano lake sits at the top of Mt. Shirane. The cobalt blue water shines beautifully, creating an aura of mystery in complete tranquility of the surrounding nature. 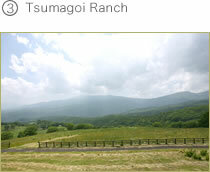 Tsumagoi Ranch sits in the middle of the Manza Highway where you can stop by to have light meals and buy local agricultural products. 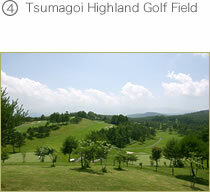 Tsumagoi Highland Golf Field has two unique courses, Asarna and Shirane with a total of 36 holes in them, stretching out on the Tsumagoi plateau. At the foot of Mt. 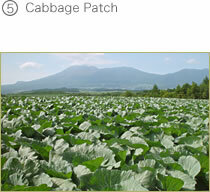 Asama lie sweeping patches of cabbages! The highway passing near and through the patches are dotted with farm stands where you can buy cabbages and other farm produce picked fresh. One summer morning in 1783, Mt. Asama erupted, belching an enormous amount of lava which is estimated to have eventually killed 1500 people. (In this same year, Lakagl'gar in the south of Iceland had also erupted, which is believed by many to have remotely caused the French Revolution in 1787.) 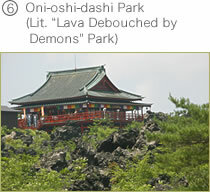 Many generations of local inhabitants in the vicinity of Mount Asama believed that there lived demons somewhere inside the mountain, and that this 1783 eruption was caused by the demons, which is why the spouted lava has been called “Oni (“Demons”) oshidashi (“debauched objects”)." The lava as it is today creates a scenic grandeurjoined together by alpine flora including luminous lichen hidden behind the rocks in the garden. Yakushi is the buddha of healing and medicine in Maheye'ina Buddhism. 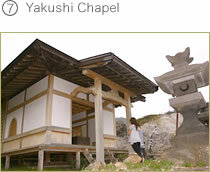 Yakushi Chapel is where this Medicine Budda is enshrined. A hundred meters above Yakushi Chapel is a rock-shelter called "Kurna-shiro Gankutsu (Lit. Rock-shelter for Kuma-shiro) where several artifacts from prehistoric times were found. Mount Moto-shirane is the main peak of Mount Kusatsu Shirane (comprising of three mountains: Shirane, Moto-shirane, and Aino-mine) with a height of 2171 meters. 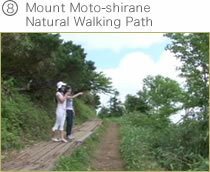 The path stretches 6140 meters long, and abounds with alpine flora. 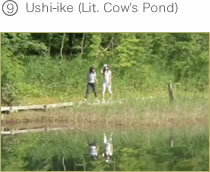 Ushi-ike is oniy a few minutes' walk (300 meters) from Manza Prince Hotel. Easy-to-slroil-about boardwalks completely surround this pond.